Kim was a great friend. A statement true for me, and I know, for many others too. I loved Kim. We all loved Kim. Everyone who knew her loved Kim. She was just that kind of person. She brought sunshine into all of our lives. 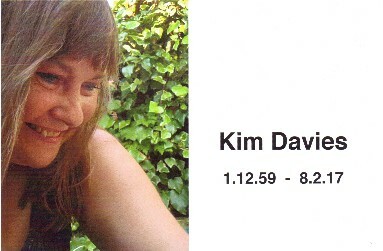 Kim was kind, thoughtful, caring, funny, witty, loyal and generous to a fault. To me, and to the Cadbury Saxophone Band, she was the musical cornerstone in everything we did, and someone I could always turn to if I needed advice, reassurance or support. She was also pretty good at telling me what I should or shouldn't do. She was always there and had that rare ability to empathise, knowing what you needed seemingly before even you did. Words of sympathy, advice, or, when appropriate, a light hearted put down came naturally to her. We will miss her gentle sense of humour. I always regretted telling the band that Kim's position was "just like the leader of an orchestra." You know. The first violinist who sits nearest to and works with the conductor. I say regretted because Kim, forever the diva, never let me forget it. She had that way of turning around to the band following one of my regular faux pas and saying "You just can't get the staff can you." She had a rare ability to know about things before she actually experienced them. She once referred to my absolutely terrible piano playing. And that was before she heard me play! How right she was! She has left a gaping hole in the Cadbury Saxophone Band. We miss her and always will. In her life we know that Kim faced many difficulties which she always made light of. To her there were more important things. Care and consideration for others came first. I will miss the phone calls asking "How are you?" if she sensed things weren't quite right. I'll miss the regular jokey emails. I'll miss her invitations to coffee - I'm coming round on Wednesday she would say. I'll miss the conversations we had in which we put the world to rights. I'll miss her at rehearsals and concerts, the ever present, just being there keeping an eye on me, and I'll miss her inspiring saxophone playing - yes, leading the orchestra. Kim was a beautiful person in every respect. Her legacy? She simply showed us how important it is to be kind to one another. And, of course, we all know, because Kim often said it, if she ruled the world it would be a far far better place. In February 2017 we lost our beloved principal saxophonist Kim Davies. In many respects she was the band and we are deeply saddened to lose her. Kim was a delight to have in the band. She was our accomplished soloist who could be relied upon to give her all in concerts and rehearsals, whether featuring on the alto sax or the soprano sax. At her funeral we heard a recording of the band playing Gabriel's Oboe (played on a saxophone in our case). Kim played the lead and I wept to think I would no longer have her sitting beside me, and no longer hear her playing that wonderful tune so beautifully. What a loss. We learnt at the funeral how popular she was with so many people and groups. As well as being a gifted teacher,Kim was able to bring laughter and joy in to so many situations. We also learnt how she coped with a number of ailments which she never revealed - she would mainly ask about you and be concerned for your health and well being, in a very caring way. Finally, Kim was THE DIVA of the band always ready to have a dig at our conductor Dave! Whether in reply to his emails (which she always replied to and shared with the rest of the band) or in rehearsals, she had the knack of catching him on the hop. I don't know how she managed it, with a grin on her face, but Dave always took it so well, in the spirit it was intended. We miss you Kim. Bless you for all you brought to Cadbury Saxophone Band. Rest in peace.